RED LIPSTICKS Selection Spring 2013 - Clarins, Clinique, MAC, Nars, Sephora - Give Me Gorgeous! 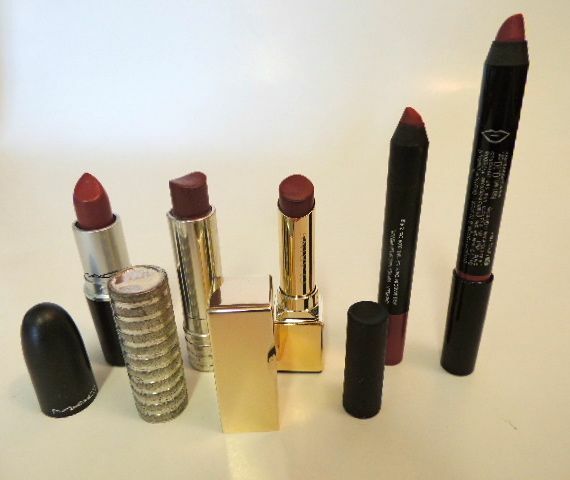 I put together this group of red lipsticks that I’ve accumulated to review some options for the ‘classic red lip.’ With so many shades and hues of reds available, I think anyone can find a red that suits their skin color. I’ve found that the best way to wear red is to pair it with a neutral eye (soft beige or pearl eye shadow and black liner, plus mascara) – for a standout red lip. The application – prep lips with a clear moisturizer (let it absorb for a few minutes), then add a bit of foundation directly to your lips for the lipstick to adhere to, outline lips with lip liner, then put on the lipstick. This will help the lipstick stay on your lips and not bleed to a drinking glass or wear off right away.